Introduction: Oceaneering Space Systems has recently introduced their newest addition to the Terabot® family of robotic manipulators. The Terabot®-S manipulator is a 5 dof robot manipulator with a heritage from Oceaneering’s history of robotics in harsh environments of subsea and space. 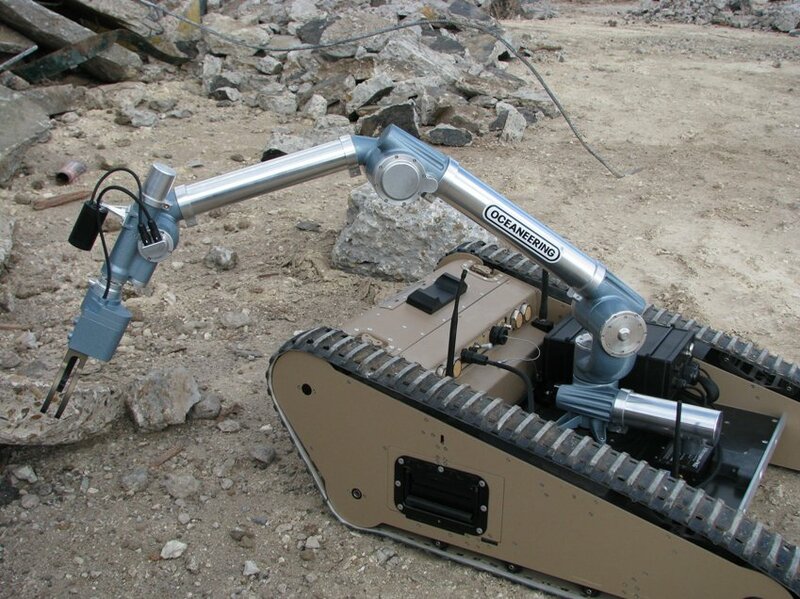 The environmentally sealed manipulator is designed for both military and civilian markets, and can be installed or retrofitted on virtually any medium sized UGV. Other features such as joint overload clutches are included for extreme durability and robustness. Oceaneering’s quick tool change out mechanism allows users to quickly swap various tools, from passive tools such as shovels to smart sensors needing power and data. While the robot weighs just 22 pounds, it is capable of handling a 20 lb payload at its full reach of 42″. A spatially correspondent master mimics the manipulators movements, and makes mastering the control of the manipulator a very intuitive process. Price: Under $30K each for the manipulator in 10 or larger quantities. Additional cost for smaller quantities and various options. Control and Software: Spatially Correspondent Master or joint space command and feedback via RS232 serial link. Tasks that can be performed autonomously: Autonomous tasks may be defined on a remote host and commanded though the RS232 serial link. Remote control: SC Master – can be operated by provided radio link for the manipulator only, integrated with the vehicle control system, or by hard wire. External sensors and types: Wrist mounted composite video camera. The Terabot®-S includes a quick tool change out capability. That feature enables the use of a suite of tools and sensors, from passive tools such as shovels, to sophisticated sensors, that can be quickly yet solidly attached to the robot. The quick tool changeout capability comes as a manual version standard or automatic version as an option. Retrofittable to almost any platform: OSS designed the Terabot®-S as a “stand-alone”, modular solution that can be easily integrated with virtually any vehicle. Spatially correspondent Master: The “S” has a very innovative and intuitive operator interface. Instead of using a joystick to move joint by joint, the Terabot S can use an optional small spatially correspondent master, shaped just like the manipulator, that commands the master. Whatever position or movement the operator puts the master in, the manipulator follows. This reduces the learning curve from days to seconds or minutes… because the robot does exactly what the operator commands it to do. Without the SC master, the robot can still be communicated with using an RS232 data interface. 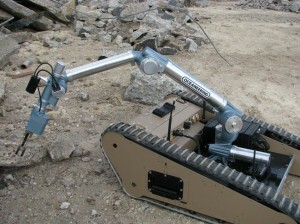 Rugged joints: The Terabot®-S is very rugged. It has clutches on each joint, protecting the joints from unintended overloads such as bumping objects or vehicle overturns. And since the manipulator has absolute encoders on each joint, even if a joint is moved, the robot knows where it is and no homing or re-indexing is required. Quick tool changeout: All the robots in Oceaneering’s Terabot family, including the “S”, have a quick tool change out capability. With power and data pass-throughs and a stout mechanical coupling, virtually any end effector tooling can be used on the Terabot. Tools could include passive tools such as digging implements, active tools such as cutters, or even smart tools such as special sensors. 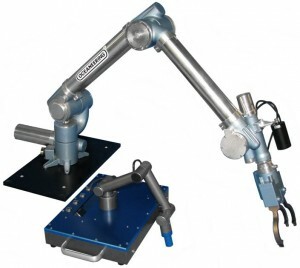 Standard is a manual interface, but there is also an automated version available, where the robot is able to change the tool remotely on command.